So, what’s stopping you from making it a good week? 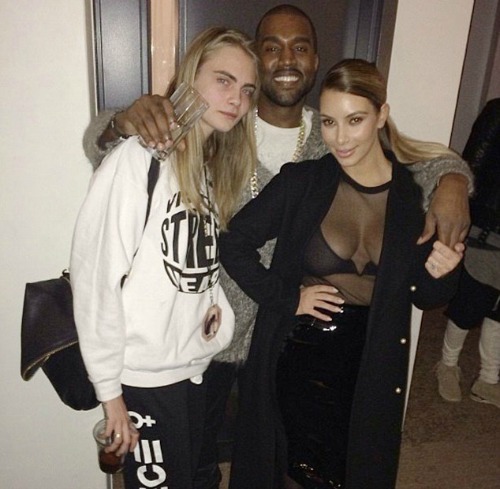 I look at British model Cara Delevigne and NOTHING stops her having a good time. She’s currently in New York and after attending Kanye’ West’s Yeezus gig, she made it backstage and struck up a new friendship. Whatever CD wants she gets! Now lets look at what happened at The Amy Winehouse Foundation ball, which was the invite of the night in London, raising money for The Amy Winehouse Foundation. Singer Tyler James and Amy’s dad Mitch Winehouse had a PDA on the red carpet. Normally I am against PDAs but this is quite sweet. Pixie Lott looked quite classy in a long red dress and 60s inspired eye make up. Are we seeing a more grown up side to her now as she’s ditching the short short shorts for something a little more chic and elegant? However, I’m not so sure about Oritse from JLS and his girlfriend, who did a Posh and Becks and wore matching white outfits. She looks ok but a man has to be VERY BRAVE to wear white trousers! So the motto of today is go out and enjoy yourself and I will be back with more celebrity gossip tomorrow (either from Azerbaijan, or most likely from the UK). Follow me on Twitter @zoegriffin in the meantime!